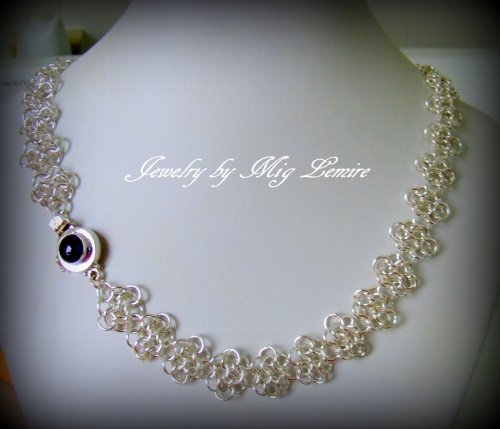 This gorgeous necklace is made of hundreds of sterling silver rings, all made by me individually and thebn woven together to make the design. This is an ancient form of weaving called chainmaille weaving. Piece is heavy and dripping with silver. I put a gorgeous purple velvet double locking clasp on this to keep it safe for you. The clasp is pretty enough that it can be worn to the front or the side or in back of the neck, giving you different looks.